While Andre Schurrle is set to head out of Stamford Bridge to German club Wolfsburg, 25-year Juan Guillermo Cuadrado Bello is on the verge of moving with the Blues. Cuadrado will go through the required medical examination on Saturday prior to his £23.3 million transfer signing from Italian club Fiorentina. There were indications earlier this month of Fiorentina coach Vincenzo Montella not wanting to part with the Colombian winger, but the transfer deal amount was to the satisfaction of the club's release clause and there seemed no other way other than for Montella to relent. Juan Cuadrado made his debut at the Colombian club of Independiente Medellin where he spent a lacklustre year from 2008-2009 scoring just twice from as many as 30 appearances. His move to Europe came in 2009 where in a 5-year time span he moved from Italian clubs Udinese to Fiorentina. It was during his tenure in the latter where his career took shape. In his 85 games for Fiorentian he scored on 20 occasions. It was during this time that he caught eye of Colombia national coach Jose Pekerman who called upon Cuadrado's services in a friendly international against Mexico. 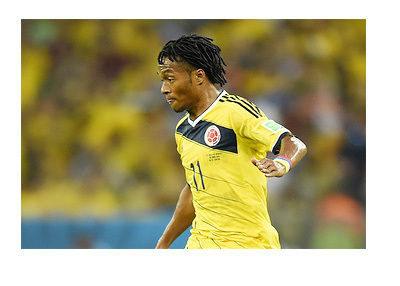 Cuadrado scored the second goal in the 2-0 win for his country. Pekerman went on to include him in the 23-man Colombian squad for the 2014 FIFA world cup. His first goal came in Colombia's 4-1 win against Japan. He performed reasonably well in the tournament with 4 assists to his credit which equalled Germany's Toni Kroos tally for the Cup. Cuadrado's versatility lies in his strength to quickly change roles as a winger, midfielder and even a full-back if need be. In fact he had started his career as a pure forward. Additional qualities like great pace on and off the ball, good dribbling skills and speedy wing-runs seemed to have caught the attention of his new owners and made him an ideal replacement for Andre Schurrle. With his medical at London set for Saturday, he will unfortunately miss out on Chelsea's vital Premier League clash with Manchester City on that day.